As the title suggests, there is a risk for every character in this ninth episode of the season. Let’s address each one and toss in some random observations about this differently paced, unusually written chapter of SouthLAnd. Lydia’s risk is, of course, her baby. She continues to proceed about her job as if she is not pregnant, running about and just generally not taking care of herself. 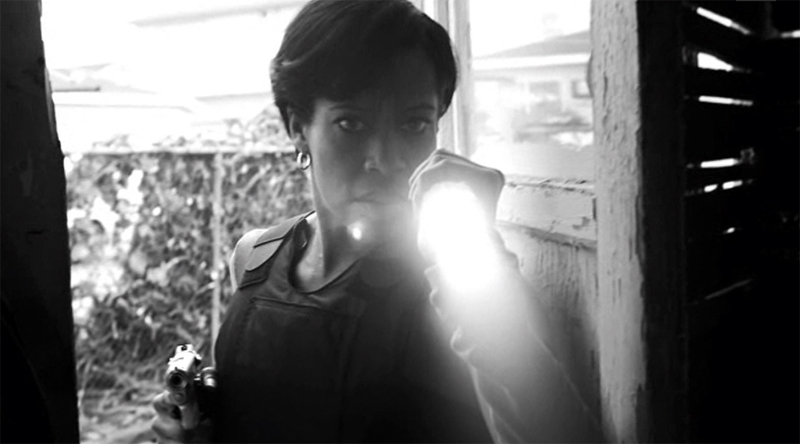 As she and Ruben investigate a gang homicide, they are ultimately led to where the suspected murderer is. At her own great risk, Lydia enters a rundown house alone where she is ferociously attacked at knifepoint by said suspect. That scene is brutal. Regina King nailed it as always; she’s one of the few actresses on episodic television who can bring tears to your eyes just by having them in hers. Lydia finally confesses her pregnancy to Ruben at the end of the scene. Is he surprised? No. He’s known all along, potnah. Jessica Tang’s risk seems to be over. She lied to the FID about the shooting involving the teen with the toy gun and lo and behold, she got the promotion to sergeant. We’ll see what the season finale holds for her. One thing she has risked is the respect of her partner. It seems to be lost, as it should be. Ben’s risk is his career. One he seems to be willing to put in jeopardy in order to get a prostitute’s daughter off the streets and out of town. Despite repeated warnings and advice from Sammy - “I’ve been in your shoes. I know where it leads. Now please take my advice and stop.” Ben just won’t let it go. Sammy’s risk is his life apparently by being Ben’s partner. As the partners flee the bullets the pimp daddy begins firing into their patrol car, a shocking, sudden violent crash of an SUV into their car leaves the viewer with the question…will Sammy survive his injuries? An added note here - as reviewer Darren Croucher has pointed out, Shawn Hatosy as Sammy prowls around a scene. If you re-watch, you’ll often think to yourself - what did he just do there? It’s interesting what you might have missed. Always watch each episode at least twice. Cooper’s risk is he’s a veteran officer, working to fulfill his goal of getting those 30 years plus one day. He suspects Tang tampered with evidence in the shooting (keeping the orange tip off the toy gun) but he can’t prove it. If he accuses her and is not believed or is wrong? He loses all trust from his peers because you always, always have your partner’s back. He knows in his heart she lied. Coop and Tang are finished; a sharp sword could not cut the tension between them in that squad car. Coop did not risk his moral compass though; he told FID what he saw; nothing more, nothing less. Michael Cudlitz is the master deliverer of the one liner, the slow, angry burn, and expressing the weariness and resignation that comes with being a veteran officer, dealing with things you simply cannot change but must accept. 2) This episode as always was visually stunning, particularly the scene with the skateboarders speeding down an empty highway. Bravo, director and DP J. Michael Muro. 3) Bravo as well to Peewee Piemonte and his stunt crew. No one will ever question why this team won an Emmy for stunt coordination. 4) This reviewer has thoroughly enjoyed Dorian Missick as Ruben. Hope he is back next season. 5) Loved the golf ball guy scene. Perfection. 6) And it's always a delight to see Dewey (C. Thomas Howell), no matter how brief the scene. Speaking of next season, 12-15 episodes seem to be in order from TNT. SouthLAnd has a brilliant ensemble that won’t be found again, award winning producers, directors and crew, one of the most loyal fan bases in all TV (and growing!) plus critical praise and a rise in ratings. Next week is the finale. After we recover, we’ll be patiently waiting for what we know will be the brilliance of season five. Raise the bar, SouthLAnd. Keep raising the bar on every drama currently on television. Twitter contest winner announced tonight! SouthLAnd Episode 4.8 "God's Work"